Have you ever wondered how a Formula One car can weigh so little, how the touchscreen on your mobile works or what an artificial heart valve is made of? 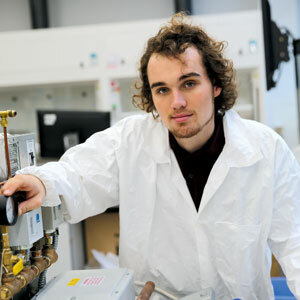 The Materials Science and Engineering programme will give you a thorough grounding in the physical and chemical structure, properties, manufacturing and design of materials. Academically, the programme bridges the pure and applied sciences. Vocationally, it teaches skills across a range of disciplines, so graduates are in demand throughout industry and business. We cover all materials: metals, ceramics, polymers and composites. Knowledge of these materials is essential if you wish to work in sectors, such as automotive or aerospace manufacture, where material selection is critical. If you choose the MEng degree, you’ll take part in a high-level group project, often sponsored by industry. The experience provides a valuable insight into real-life engineering design and project management.